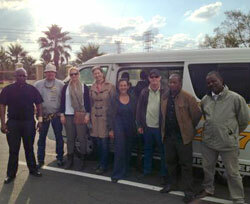 Stéphanie Tobler Mucznik and the film crew in South Africa. Stéphanie Tobler Mucznik, senior media relations specialist for Europe and Africa in RI’s Zurich office, spent a week with a film crew in Johannesburg, South Africa, documenting the three-day family health day event organized by Rotarians for Family Health and AIDS Prevention. “I believe God sent us the Rotarians”, says single mother Innocentia. We are chatting in her family’s backyard, Innocentia is sitting on a wooden stool, and her baby is sleeping on her back, wrapped in a towel, while Grandmother Gloria is doing the laundry in a metal bucket. I am in South Africa to document the Family Health Days, held on 9-11 May and we are filming a day in the life of Innocentia. Talking to people like her makes me understand the wonderful work Rotarians do and how much Rotary’s support is needed. Innocentia lives in a township close to Pretoria, South Africa’s fifth largest city. The township has no electricity and there is no water for domestic use. If medical assistance is needed, a mobile hospital passes by once a month, or maybe not. Earlier today, Innocentia and her baby attended the health days event. Volunteers in the townships provided HIV counseling and testing, TB testing, diabetes and blood pressure screening, polio and measles vaccinations, deworming and vitamin A tablets. I was impressed how patiently Innocentia and other people were waiting in line to get their babies vaccinated or to get HIV testing. I noticed that there were almost no men. The Rotarians explained to me that culturally the mothers take care of the children. But then Piet and his baby girl came. Piet told me that he feels responsible for getting his baby vaccinated as his wife is at work today. I felt Piet did something very brave by acting differently than his cultural customs. The next day, I visited the township of Zandspruit, close to Johannesburg. The health days included an event with musical entertainment. Not even a Swiss could sit still as the people of Zandspruit started singing the national anthem of South Africa, shouting and clapping their hands. What a wonderful moment in an environment that seems to lack many things, but still the people manage to have fun and smile. I am hoping that there will be many more Family Health Days events in South Africa as well as in other African countries because the people in the townships need the event and it is a great investment in the future of those children who need help desperately. This entry was posted in Eradicating polio, Fighting disease, Saving mothers and children and tagged health, South Africa by Rotary International. Bookmark the permalink. When you are done with the film, it might be a good idea to put it on youtube.com. I am District 5170’s Technology Chair and I would put a link to it on our district website……. Thank you for sharing this story with us. As a public health student and a rotary ambassadorial scholar I have a strong interest in Rotary’s increased involvement in efforts of HIV & AIDS prevention, treatment and care. UN organisations have a goal of getting to zero new infections and zero AIDS related deaths. I strongly believe that this mandate needs the concerted input of Rotary International.